- Preheat oven to 350 degrees. Spray a 9 x 13 baking dish with cooking spray or oil mister. - Heat olive oil in a large skillet over medium heat. Add onion and cook until softened, about 4 minutes. Add zucchini and mushrooms and cook until softened and liquid has boiled off, about 7 minutes more. Remove from heat. 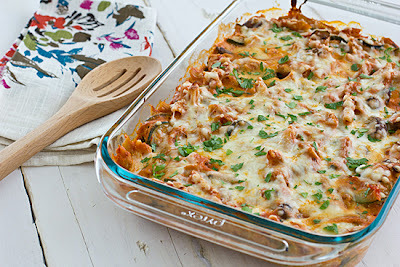 - Add pasta, marinara sauce, and ricotta to skillet with vegetables. Stir until well combined. - Pour pasta mixture into baking dish. Top with cheese. Bake for 30 minutes. Sprinkle with parsley before serving, if desired.